What’s Green and goes ARFF? 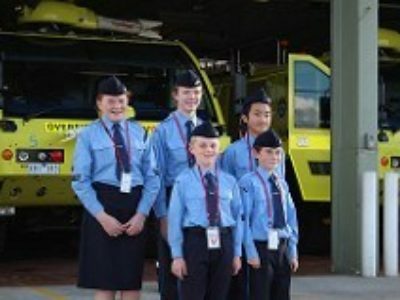 In May, the cadets and officers from Sunbury Squadron were granted the very rare opportunity to visit Melbourne Airport’s Aviation Rescue and Fire Fighting Service Station No. 1. Contained within the airport’s highly restricted area known as ‘Airside’ and little more than 200 metres from runway 16/34, Melbourne ARFFS’ main fire station is crewed round-the-clock by 17 specialist fire-fighters. With Station Fire Commander Paul Gray and his team as hosts, our group were provided with an informative tour through the station facility and its 4 massive, florescent-green Rosenbauer Panther 6 wheel fire tenders. Always filled to the brim with 11000 litres of water and 1200 litres of foam concentrate, the sheer size and power of these 24 tonne, diesel-engined, all-wheel-drive monsters is staggering. Capable of accelerating from standstill to 80kmh in less than 35 seconds, they can travel across nearly all forms of terrain and then spray their fire suppressant foam at nearly 600 litres per second to distances of up to 100 metres, smothering any fire in their path. The ARFF service operates 2 stations at Melbourne Airport. Station 1 responds to aircraft and aviation-based hazards while the other smaller station provides support to the passenger terminals and surrounding public areas. The airport’s 200 aircraft movements per day are all closely monitored from the Station 1’s Control Room. At the push of a button, the Control Room can direct fire crews to where ever they are needed throughout the airport. Managing over 2000 callouts per year, Melbourne’s ARFF service mostly responds to requests for assistance regarding passenger medical conditions and vehicle road accidents, however occasionally the callout is for something ‘bigger’ such as overheated aircraft landing gear, tyres bursts on landing, fuel spills or most recently, a plane colliding with an aerobridge whilst parking. Fortunately for us, Australia’s key focus on aviation safety means that aircraft callouts are very rare and mostly end with little damage and no injuries. Quiet or busy, it is reassuring to know that our airports are being closely watched over by these safety guardians and their fluorescent-green trucks. Our thanks go to our wonderful hosts Station Fire Commander Gray and his fire-fighting team for the tour and demonstrations of both the station alert system and their Rosenbauer Panther fire tenders. Sunbury Squadron also wishes to thank Acting Superintendent Chris Quinn of ARFF and Karl Gombos of Airservices for making this special visit possible. More photos can be viewed online here.